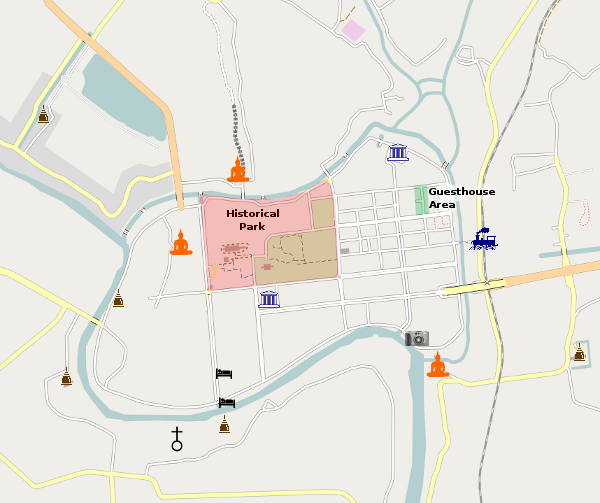 Map of the old city environs. Click on one of the icons to display detailed information about each sight. All of the information in this online guide is available as a handy ebook, in formats that can be read on any ereader or smartphone. Check out our ebook guides. The old royal city lies on an island formed by the confluence of three rivers, with a little help from man, I think. Following ancient beliefs about the layout of cities, in which the city is thought of as a living thing, the king's abode sits at the 'head' in the north-center part of the island. An important temple - Wat Mahathat - is at the 'heart' in the center. Significant religious and government buildings face east, towards the rising sun. The entire island was once ringed with a defensive wall, guarded by 16 forts. In the end the wall didn't protect the city from the invading Burmese. Little of the wall exists today, since many of its bricks were carted off to build the new capital at Bangkok. Most of the major sights lie within the Historical Park in the north-center of the island. Lining the banks of the rivers around the island are several grand temples, which are also worth a visit. For those staying a night or more in Ayutthaya, there are some hotels and other accommodations spread all over the island as well as near the train station. 'Budget' travelers will want to head to a street sometimes referred to as 'Farang Street' off Naresuan Road near the fresh market, which resembles a miniature Khaosan Road. There are several guesthouses on the street, along with restaurants and places where you can rent bicycles.